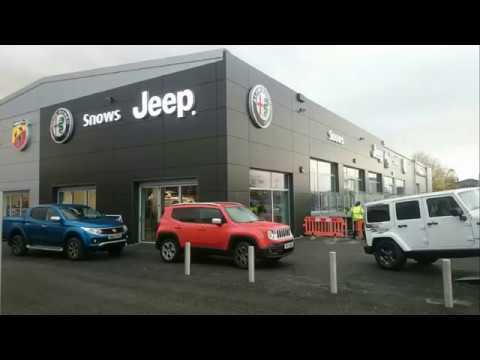 We have compiled a video of day by day snapshots, revealing the building process behind our brand new FCA showroom that is now open for business in the South. What started as a bare construction site, is now an immaculate new showroom! Snows Volvo's Master Technician, Drew Batchelor, took on the challenge to generate a video showing the development of our fantastic new Fiat Brand Centre in Southampton. Drew successfully produced a fast-paced construction compilation made up of an impressive 1048 pictures! Many members of Snows staff have commended Drew and his admirable efforts in showing the vision and creation behind our brand new Southampton showroom. Our new dealership is dedicated to the FCA brand, representing models from Abarth, Alfa Romeo, Jeep and Fiat. We're thrilled to say that our Snows Fiat Brand Centre is now recently opened and ready for business. Complete with latest models from these renowned FCA brands, as well as providing Approved Used cars and a full range of maintenance and Aftersales services. Not to mention, a great team of salesmen, business experts, Motability specialists and trained technicians on hand, who are always willing to help. Snows now represent 42 franchised dealerships across the South of England, where we aim to deliver the highest standard of motoring services to as many customers as we can. We look forward to welcoming both our new and existing customers to the latest addition to our extensive number of dealerships. Located on Second Avenue, Millbrook in the centre of Southampton, we are proud to be an accessible and reliable choice for local motorists and to be able to meet their requirements, no matter what.